So, darlings sekalian, please can vote for me EVERY SINGLE DAY OF YOUR LIFE, from 1st to 15th October, 2007? Why must you do that leh? I know lah, it is very selfish to ask people to go vote every day. But hor, let’s say I win either the first two prizes, I give 10% of the cost of the price to charity. How about that wor? Can or not? That’s like RM300 liao wor. Cincai lah, every day one vote. No need to sign up anything wan. 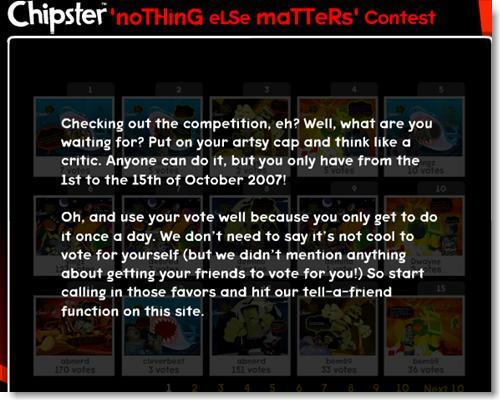 Vote for me, pleaseeeee…..I buy you Chipster and promise to kapster more to entertain you guys. Vote, vote, vote. #320 318 on page 22.
voted because of charity…ngek ngek ngek….who else need help and also get the prize donate to charity? jUdY – 10% cost of the first and second prize. Hehehe. voted. u everyday remind me to vote then i vote lar! Fulamak, some already got thousand over votes. I’ve done my part. Good luck! bryan – Never mind, I hire coder to hack the system. LOL. You’re at page #22, contestant #318 and not 320 lah! 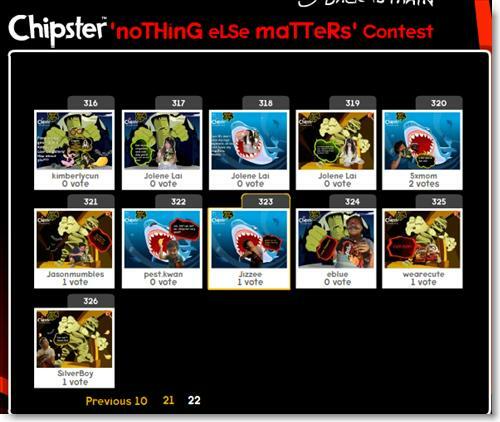 Mmm saya sudah undi hari ini..
L’abeille – Aiyerr…the screenshot showed 320. That means the number changes liao. Oledi. So many votes lah other people, how they do! Anyway, some of the pictures are good and got high votes. Some of them really very normal but got high votes oso. What gives??? boss stewie – MacBook worrrrrrr….must play dirty mah. angieT – yalor, I wonder how they select in the end? Little Ray – Bluff wan lah, voting only start yesterday, 1,800 votes, celebrities oso kenot get that kind of support lah. Like that Perez Hilton nomination? I sour grape, losing liao, say people cheat. Hahahaha. I’d like to bother you with an Off-Topic issue. The worldwide blogosphere is currently organizing a campaign to support a peaceful revolution in Burma. Probably you could have a look at http://free-burma.org/index.php and support this campaign and help to spread the word throughout the blogosphere. 3)Under General tab, Delete Cookies. 4)Repeat steps 1-3 over and over again. I’m not going to do that for you ah, Lilian. Not THAT free yet. lol. I am supporting kao kao and I forgot how many times my cookies have been cleared.